Finding affordable housing in Toronto is difficult. But finding affordable housing that is accessible is almost impossible. “I think there’s this pre-conceived notion, like a stereotype almost, in [people’s] minds what renting to a person with a disability is like. That we won’t pay rent, that we aren’t going to go out and get a job to pay the bills and just some really nasty things that aren’t true,” said Michelle Woolfrey, a third-year arts student. Woolfrey is visually impaired and has a service dog named Thompson. She said the biggest struggle for her was finding a building that allows dogs. 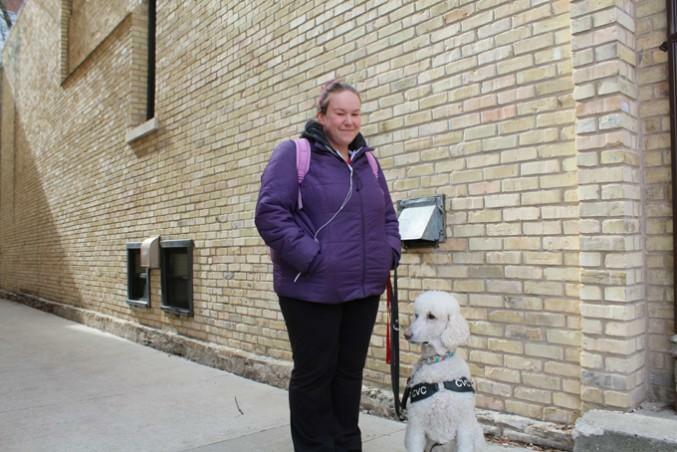 Under the Accessibility for Ontarians with Disabilities Act (AODA), people cannot be denied a service because of their service dog, and landlords can’t deny them either. But Woolfrey said this has happened to her about a dozen times. Woolfrey said she never took further action after being turned down because she wouldn’t want to live in a place where people didn’t accept her because of Thompson. “There are days and there are times when I just don’t feel like fighting,” she said. Woolfrey’s main living requirements include outdoor space for Thompson and an accessible elevator. Woolfrey said a major difficulty was finding a building in a safe neighbourhood. The apartment she lived in last year was at Dundas and Sherbourne. “There were shootings, someone broke into our apartment, there was fighting all the time. So it was really unsafe,” she said. Woolfrey and her roommate finally moved out after a year. Woolfrey then applied to the Housing Stabilization Fund under the Ontario Disability Support Program but had to wait six months to hear back. Woolfrey said she called three times to ask if the letter was sent and when it finally was, she was rejected. She said this discouraged her from applying to any other programs, so she and her roommate looked for apartments on their own. After an “extremely stressful” process of three months of searching, Woolfrey and her roommate finally found their current apartment. They have been living there for six months and plan on staying there for as long as possible. But the hunt to find affordable and accessible housing in Toronto will only get more difficult due to the increase in demand from the aging population and the general growth of Toronto’s population, according to documents provided by Rob Cressman, director of Toronto’s social housing administration. These documents were used in a panel discussion last week where Cressman discussed the lack of affordable and accessible housing units in Toronto. Other reasons for the lack of affordable and accessible housing include “insufficient funding for things like retrofits for those with low-incomes, housing allowances, housing subsidies, social housing repairs and retrofits,” said Cressman in an email. Cressman said there are currently 598 households on a centralized wait list for subsidized wheelchair accessible units. The centralized wait list is managed by Housing Connections, an organization that manages applications and wait lists for subsidized housing in Toronto. But these applicants are included in the regular chronological wait list. According to a Housing Connections report, as of December 2015, 95,280 households are on the wait list for social housing. Those who are requesting wheelchair accessible units are not considered priority applicants. “Those who suffer the most are often the most vulnerable. Students should be seeking assistance from their college or university. Those looking for accessible units have even fewer housing options and that can mean a longer search for housing and consideration of other geographic locations,” said Cressman. Ryerson’s Off-Campus Housing office assists students in finding places to live that are not Ryerson residences. Valerie Bruce, who is the coordinator of Housing Operations and Administration at Ryerson and oversees the Off-Campus Housing office said, “To be honest, nothing,” when asked if there’s any specific initiative to help students with disabilities to find housing. Jessica Geboers, a recent Ryerson graduate, lived in Pitman Hall for just over two years and said she was satisfied with the building’s accessibility. Geboers has a mild form of cerebral palsey (CP) and uses a cane and occasionally a wheelchair. Her biggest living requirement is a central location. When she moved out of residence, for about three months Geboers and her roommate, who also has a mild form of CP, were looking at 10 to 20 listings a day but only went and saw five buildings that met their living requirements. Eventually they found a unit that is about a 10-to-15 minute walk to Ryerson. But she found herself coming late to class, especially during the winter. “It was an adjustment for sure,” she said. Geboers said that the lack of affordable and accessible housing is an issue because it’s something that a lot of people don’t know about. “The provincial government needs to be more open with people with disabilities, and talk to them about what they need and how to achieve it,” she said.